VIA`s high performance audio controller chipset and codec chipset for a high quality sound card are employed to realize both stability and high quality sound. Perfect ground design of the power regulator and the high quality elements guarantee the safety most. Playback of an MP3 file, an audio CD, and window basic sounds is 2 channel stereo. MAYA 5.1MK-II series enables such 2 channel sounds to be mixed up to 5.1 channel to output and also enables 5.1 channel to be mixed down to 2 channel for the use of a 2 channel speaker, a 2.1 channel speaker, an earphone, a headphone, and so forth. An independent headphone output(POS) in addition to the basic front, rear, center/woofer outputs is supported for the easy use of an earphone and headphone. A headphone amplifier is basically embedded in the headphone output for excellent performance(※ The headphone amplifier is embedded in front output of MAYA 5.1MK-II ZENI). Anti-pop circuit is applied to minimize pop-noises generated by power ON/OFF of a computer. Users can enjoy EAX 1.0/2.0, Direct Sound 3D games with QSound Effect supported in Windows XP / Vista / 7. LP type PCB is designed to provide an additional bracket for LowProfile standard(slim PC and bare born PC) so that MAYA 5.1MK-II series are available for a middle tower PC or a slim PC. Almost all operation systems such as Windows XP 32/64-bit, Windows 32/64-bit, Windows 7 32/64-bit and so forth are supported. And VIA`s highly stable and compatible reference driver with a digital sign is provided. Computer requirement is very crucial for enjoying all multimedia functions of MAYA 5.1 MK-II series. reco㎜ended requirement should be met for the best performance. ① MIC/ LINE-IN : Connecting with a MIC or TV receiving card. ② FRONT-OUT : Connecting with a front speaker. ③ REAR-OUT : Connecting with a rear speaker. ④ CENTER/WOOFER-OUT : Connecting with a center/woofer speaker. ⑤ DIGITAL(OPTICAL)-OUT (angular) : Connecting with a decoder-embedded speaker or a receiver amplifier. ⑥ S/PDIF OUT : Coaxial output jack for internal connection with HDMI supporting graphic card or expansion connection for case front bay. ● 2 channel(2.1 channel) speaker or headset is supposed to be connected to FRONT-OUT for use. ● Uncheck Control panel → Play Back → MIC → MUTE for the use of MIC on MIC/LINE-IN. ● Uncheck Control panel → Play Back → LINE-IN → MUTE and also uncheck Control panel → Play Back → MIC → MUTE for connecting a TV receiving card with MIC/LINE-IN. 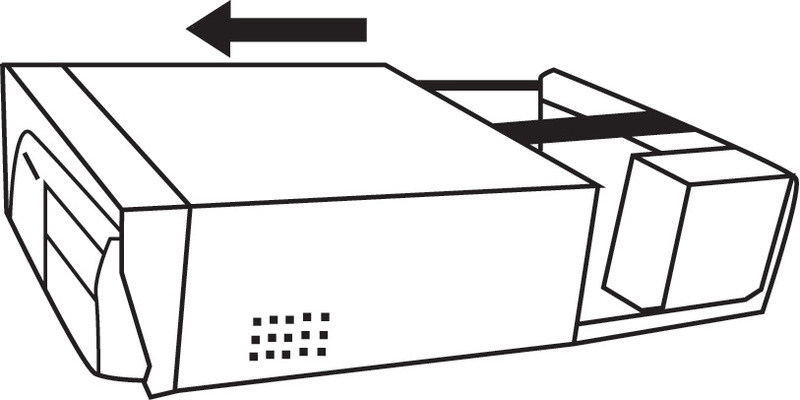 ※ Avoid directly facing a beam lit from an optical-out port after an optical cable is connected to the optical-out port for preventing damage to vision. 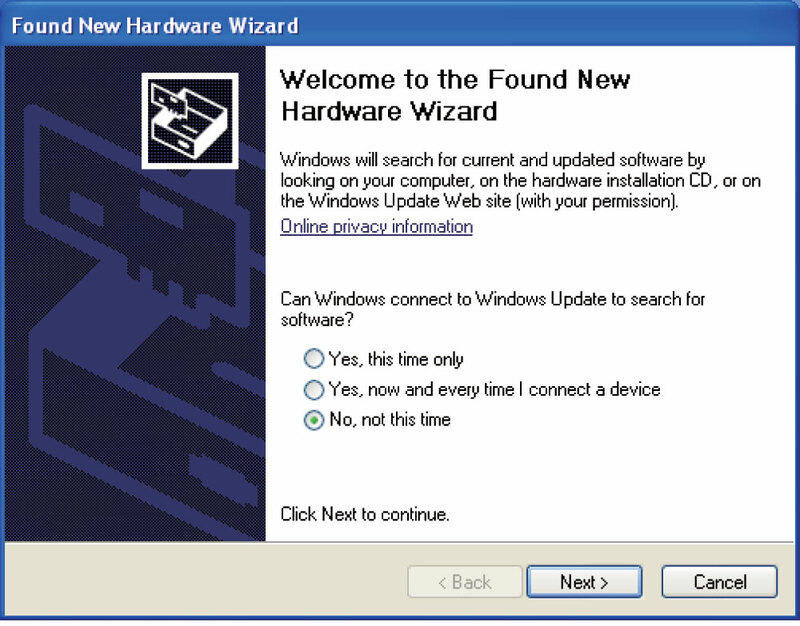 Those who are not familiar with hardware installation had better install the product with an acquaintance who knows about computer well, and those who install the product for the first time should read below to install the product. 1) The PCI card is wrapped with static electricity prevention plastic. You had better not unwrap the PCI card before installing it on your computer for preventing any damage. 2) Turn off your computer. Disconnect the power cable. motherboard of your computer for installation of the PCI card. 4) Touch a metal part of the computer case or other grounded materials to discharge static electricity within your body. The static electricity is partially removed by rolling up the sleeves or washing your hands with soap. 5) Hold the PCI card by an edge and a guide part which is a place for securing the PCI card to the computer case with screw. You had better not touch the parts inside the edge of the PCI card. 1) Remove the computer case from the computer. Acco㎜odate the sound card to a vacant PCI slot. The latest motherboard usually has three types of slots which are the longest PCI Express 16x slot for graphic card, the shortest PCI Express 1x slot, and the PCI slot for the PCI sound card. 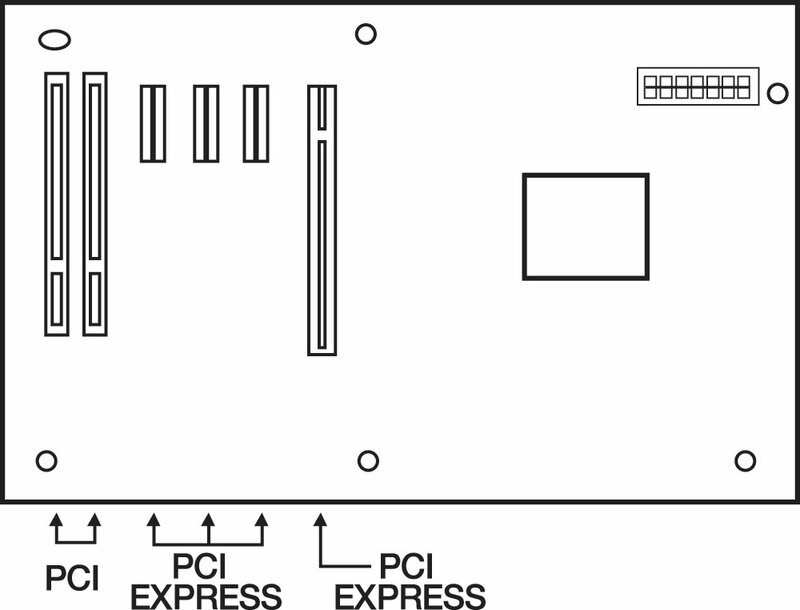 The PCI slot has the same length with the PCI sound card so that users can easily locate the PCI slot. ※Caution : For slim case, exchange the sound card with the provided LP type bracket, and then install. 2) Locate a PCI slot. Remove the empty guide from the computer case. The guide is usually inserted in a vacant slot. When installing an extension multimedia card, users are strongly encouraged to acco㎜odate the sound card to a slot which is positioned one or more slot away from the graphic card. 3) Insert the sound card in a vacant slot. Slowly press the sound card after exactly aligning the bottom and the guide part of the sound card with the slot. Firmly press the sound card into the slot until it fits snugly, and then use the screw to secure the guide part and computer case. ※Caution : If the sound card is wrongly acco㎜odated to the PCI slot, then the power is on,system including the sound card may cause severe damage. 4) After completing the installation of the sound card, place the computer case back on the computer, reconnect the power cable, and install the speaker. ※Caution : Users should use AMP-embedded speaker using power cable. There are some check-out points to be performed prior to driver installation as follows. The sound devices are generally embedded in the most of latest motherboard and are considerably inferior to the PCI sound card purchased. Newly installed PCI sound card occasionally conflicts with on-board sound devices. 3~6 stereo terminals around USB port indicate that there are existing sound devices on the motherboard. Please refer to below for setting the sound devices as “Disable”. ※Caution : In case of wrong setup of motherboard ROM BIOS, it may cause a booting error. Users are strongly encouraged to consult about the setup with manufacturer of your motherboard. 1) Turn on your computer, and then keep pressing [DEL] to enter CMOS SETUP. Method for entering the CMOS SETUP may differ depending on the motherboard, mostly by pressing [DEL], but rarely by pressing F1, F2, or F10. 2) Select Sound Setting mostly from Onboard Device or Integrated Peripherals, but rarely from Advanced Setting or Chipset Setting. 3) Set Onboard Sound, HD Audio, AC`97 Audio, MIDI, and Gameport as Disable. Press Esc. Then Save & Exit appears. Press the Save & Exit to complete the setting. Unless motherboard chipset driver, window update, and service pack are properly installed, error or continuous noise may occur during driver installation of the PCI sound card. Therefore, if the operating system is newly installed, window update and service pack as well as motherboard chipset patch driver included in the installation CD bundled with motherboard should be applied prior to installation of the sound card. If you think you don`t know well enough about your motherboard chipset, please consult with manufacturer of your motherboard. 1) After completing sound card installation, restart your computer. If you are prompted for new driver found, click cancel, and then insert the bundled installation CD into the CD-ROM drive. 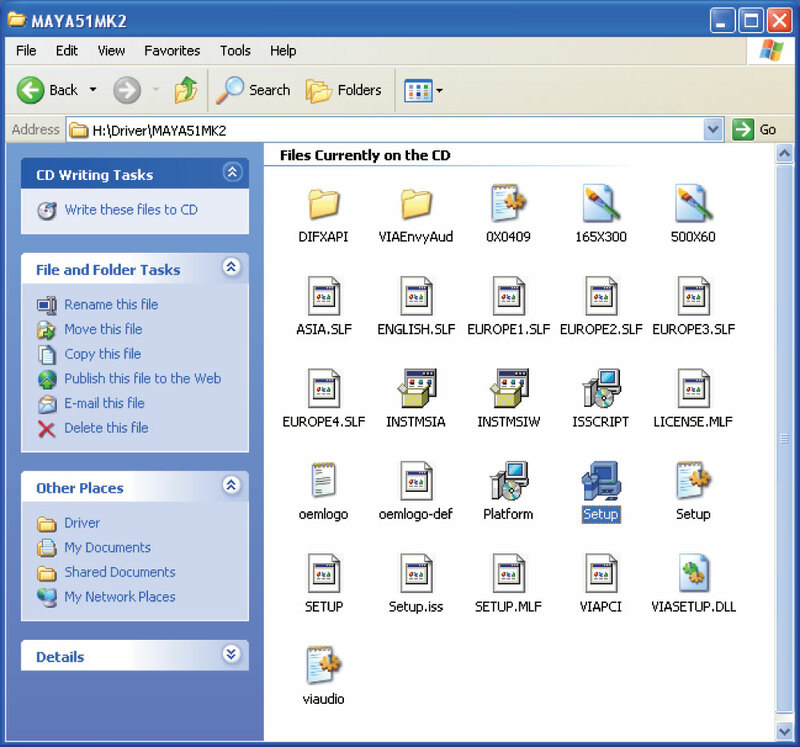 Click CD-ROM in my computer, and then execute Setup.exe file in Driver → MAYA51MK2 folder. ※Caution : By simply specifying a driver location, the basic driver may be installed like the existing sound card. If you want to use a control panel program, you should use setup program to install the driver. 2) After completing the installation as follows, restart your computer if prompted. 3) After restarting your computer, the control panel icon is created on right side of the taskbar. Also the Audio Deck control panel program is registered on start program menu. 4) Click the control panel icon on the taskbar, and then control panel appears on the screen. 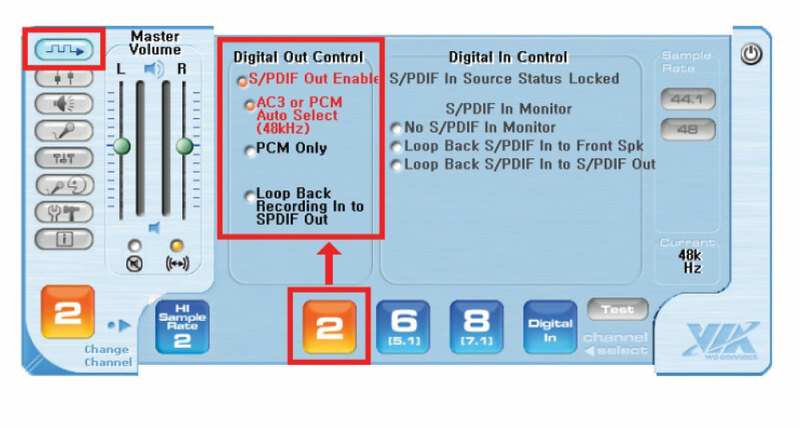 You may set volume control, digital output, analog output channel configuration, input configuration, and so forth. Click the Audio Deck icon on right side of the taskbar, and then the control panel appears on the screen. ① S/PDIF Control : Sets DIGITAL-OUT. ② Speaker : Sets speaker output channel. ③ Play Back : Controls wave output, soft synthesis, and DIGITAL-OUT volume individually. ④ Recording : Records external ANALOG-IN such as windows playback sounds and MIC LINE-IN sounds. ⑥ KalaOK : It sets Vocal Cancel and Pitch control. ⑦ Advanced Control : It sets Stereo Expander, QSound Effect, and so forth. ⑧ Information : Shows driver, window, direct X, control panel versions and so forth. ⑨ Mute : Gets into Mute state. ⑩ Link : Controls right and left channel volume simultaneously. 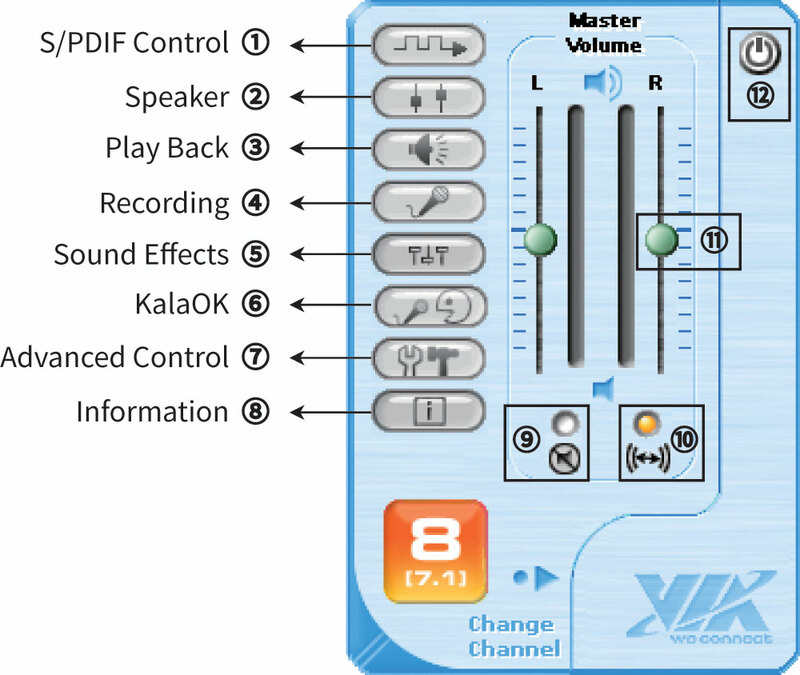 ⑪ Master Volume : Controls volume of the sound card by moving volume fader up and down. ⑫ Exit : Allows the control panel to disappear from the window screen. Users may set Digital-Out mode for the use of a decoder-embedded 5.1 channel speaker or receiver amplifier. In Digital Out Control, Digital-Out mode can be selected. In Sample Rate, if the Digital-Out mode is set as PCM Only, output sample rate can be selected among 44.1㎑ and 48㎑. In Sample Rate, if the Digital-Out mode is set as Auto, original source sample rate is outputted, and playback frequency is shown on Current. ●S/PDIF Out Enable : If it is checked, digital output is activated. You may identify red light lit from opposite side to the optical cable when the optical cable is connected to the optical port. If it is unchecked, the digital output is deactivated, and the red light is turned off. ●AC3 or PCM Auto Select (48㎑) : It allows compatibility with all sound formats such as MP3, audio CD, DVD movies, and general movie files. It also allows pass-through Digital-Out for the use of the decoder-embedded speaker or receiver amplifier. ●PCM Only : Check this for the use of high performance external DAC like DR.DAC2 of AUDIOTRAK In PCM Only mode, select Hi Sample Rate 2 Channel mode in speaker output channel configuration on the bottom of the control panel to apply 24bit/96㎑ of high quality Digital-Out during the use of external DAC(Digital to Analog Converter). You should check out Digital-In support frequency of an external device prior to selection of the Hi Sample Rate 2 Channel mode, because the external device can not receive signals which are out of Digital-In support frequency range. ●Loop Back S/PDIF In to S/PDIF Out : It converts external Analog-In such as MIC and LINE-IN to Digital-Out. ※Caution : During Loop Back S/PDIF In to S/PDIF Out mode, recorded sound is outputted, not playback sound. So, in Recording, select a source to be applied to Digital-Out. Turn down the recording volume properly to remove noise caused by amplification. ●AC3 Only(48㎑) : It allows the pass-through Digital-Out during playback of DVD movies and AC3 movies. *This function can use in Windows XP. Users can set output channel in accordance with your speaker. 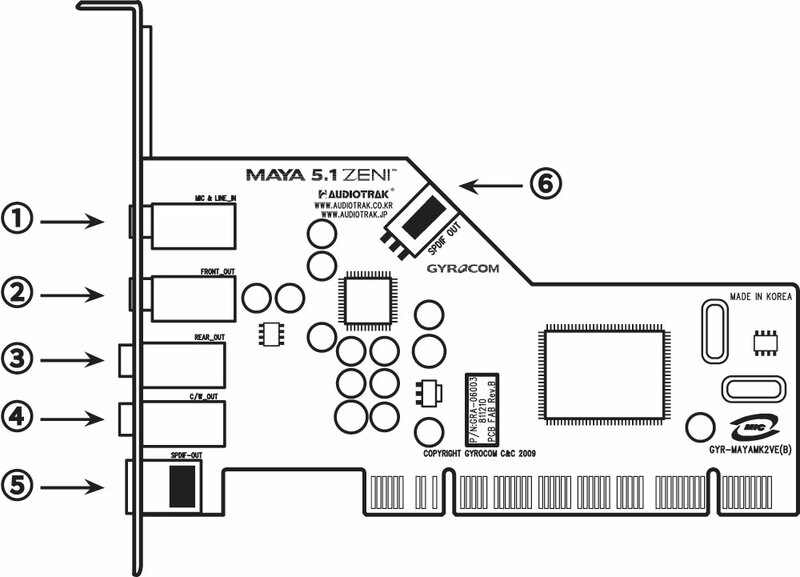 MAYA 5.1MK-Ⅱ POS / ZENI sound cards support speakers from 2 channel up to 5.1 channel. So, appropriate configuration for your speaker is desirable to set. ● Press 2 to select 2 channel output for use of a 2 channel(2.1 channel) speaker. ● Press 6(5.1) to select 5.1 channel output for use of a 5.1 channel speaker. ● Press Test to perform a speaker test. ※ Uncheck Stereo Expander in ⑦Advanced Control for separating sound during the speaker test for an analog 5.1 channel speaker. ※ Caution : MAYA 5.1MK-Ⅱ does not support 8(7.1) channel and Digital-In. So, please don’t check those check boxes. you can control output volume(monitoring volume) about external analog source of line-input and Mic etc. Users may record Analog-In such as MIC and Line-In, and Windows playback sounds. ●To record Windows playback sounds, select Stereo Mixer in Recording Select and turn down the left volume appropriately. If the volume is low during use of a low sensitive MIC such as a dynamic MIC, check 20㏈ boost option on the right Advanced Control. ※ Avoid too much high recording volume which may causes an increase in Gain and sound distortion. ●Equalizer : If it is checked to be activated, Equalizer is usable. - Press Preset to load or store preset value. - Check Smooth Slider to be convenient for some of adjacent values to be getting controlled simultaneously. ●QXpander : As a 2 channel virtual surround function, it gets phases of Stereo-Out sound into the center or extends the phases to make spatial sense. ●Vocal Cancel : It removes vocal range from playback of music. ●Key Up / Key Down : It controls Pitch using Key up/down. ●Restore : It is restored default. ●Stereo Expander : It expands the output of the front channel to center/woofer channel to output. ※ Caution : If it is checked, 5.1 channel sound separation is not applied during the test of 5.1 channel speaker or playback of 5.1 channel movies. So, uncheck this for 5.1 channel sound separation. ●Smooth GUI Mode Enable : If it is unchecked, output level meter is shown in Wave of Master Volume and Play Back during playback. ※ Caution : If it is checked, Qsound Effect mode is applied. So, check this unless you play games or use Qsound Effect for higher quality sound. QSound Effect is not supported in Windows XP 64Bit. You can check out versions of the driver, window, direct X, control panel, and so forth. in Information. Q: How Can I Remove Driver...? If an error in the control panel occurs or the driver is required to be updated, remove the previously installed driver, restart the system, and reinstall the driver. For removing the driver, execute Setup.exe file in the installation CD to uninstall the driver. Or go to Control Panel → Program Add/Remove, and then execute Unlnstall Envy24 Family Audio Device Driver. Q: What If the Computer Do Not Recognize the Device...? Your computer do not recognize the PCI card which doesn’t fit snugly, so that errors may occur. Separate the PCI card from the PCI slot and then firmly press the PCI card into the PCI slot again. If the PCI slot is defective, try to install the PCI card on another PCI slot. Gold-striped tabs of old PCI card which are directly contacted to the PCI slot may be corroded by dust or water that are invaded inside the computer, so please scrub the gold-striped tabs clearly with eraser or lubricant. Q: What If the Computer Is Down During Driver Installation...? The driver may conflict with other hardware devices so that the computer gets down during driver installation. Check if there is an on-board sound device on the motherboard, if so, deactivate the embedded sound device. After that, if you still experience the problem, try to install the sound card on another slot. If the computer is still abnormal, remove the existing PCI devices to perform inspection and consult with service center. Q: I’m Using Decoder-Embedded 5.1 Channel Speaker. Is 5.1 Channel Supported During Playback of DVD or AC3/DTS 5.1 Channel Movies With Optical-Out...? You can apply Optical-Out with 5.1 Channel-Out by setting Pass Through Digital-Out in the movie players for playback of DVD, Dolby Digital, DTS formatted 5.1 channel movies. Go to the movie players → Environment Setting → Speaker Setting(Channel Setting) → Check Pass Through Digital-Out. Q: Should Cable Be Connected For Playback Of Audio CD...? There are two ways to play an audio CD using the CD-ROM drive. One is to use Analog-Out of the CD-ROM drive, and the other is to transfer digital data through the data cable connected to motherboard. When the audio cable(4 pins) is connected to the Analog-Out on the rear of the CD-ROM, sound quality from the CD-ROM lowers due to very low quality DAC chip mounted in the CD-ROM. Also, it’s troublesome that the audio cable is to be required and is to be connected to inside of the computer. On the other hand, in CDDA mode which is Digital CD-Out type, the audio cable connection is not required between CD-ROM and the sound card, instead, you may experience best quality sound by using Wave-Out of the sound card directly connected through the data cable to the motherboard. Control Panel → System → Hardware → Device Manager, whereas users may double-click the DVD/CD-ROM drive and then press Property. If ‘Use digital audio in the CD-ROM’ is checked as Default, Wave-Out will be applied through the sound card by reading the music CD as data. If sound is unstable in spite of ‘Use digital audio in the CD-ROM’ mode, transfer mode of the CD-ROM must have been set as low. Please change the transfer mode for stable sound. See the next question for changing the transfer mode. Q: What If Cut-Off of Sound Occur or Noise Is Generated During Playback of Audio CD or DVD...? Windows such as Window 2000, go to Control Panel → System → Hardware → Device Manager to activate the DMA mode as follows. If Intel Application Accelerator is patched in a motherboard based on Intel chipset, DMA mode will be automatically set as default, but in case of other chipset, please check if the DMA mode is set. The cable connecting the motherboard and the CD-ROM is a 40 pin-cable(less than DMA33 mode), but if 80 pin-cable(for connection of DMA66/100/133 HDD) is used, troubles may occur. Q: How Can I Do When Noise Is Generated From the Speaker Although the Sound Card Is Properly Installed...? 1) Turn down window and speaker volumes. First, turn down the window basic mixer volume, and then control the volume of the sound card to prevent excessive output. 2) Check the graphic card and LAN card, and Disconnect IRQ. In case that the sound card conflicts with an embedded sound device or shares IRQ with the graphic card and LAN card, noise is most frequently generated. Abnormal acceleration of some of the graphic card may cause increase in PCI bus occupancy or abnormality of the PCI. So, for troubleshooting the graphic card driver should be replaced with a regular one, and if the over-clock is applied, cancel the over-clock. The other devices except sound devices also may cause noise generation. Especially, the graphic card and LAN card causes most of the noise generation. Therefore slot replacement and device inspection for the graphic card and LAN card are reco㎜ended for troubleshooting. Devices mounted on the computer are operated together in one operating system. If the motherboard chipset or optimized drivers for each device in the computer are not properly patched, data transfer errors or device errors may occur. Check existing motherboard chipset for chipset patch, and update drivers of installed devices as latest version. Also, update motherboard ROM BIOS as latest version. If data transfer mode between the hard disk and CD-ROM is not properly set or the hard disk data cable is wrongly connected, it may cause various noises, errors, and latency of the system. Data transfer between hard disks having different transfer speed may cause noise generation or cut-off of playback of a large file like a movie. In this case, copy and paste the file in the hard disk where the operating system is installed, and then play the file. 5) Check ground of the computer. Occasionally, current is felt by hand on the computer case mainly due to improper ground. 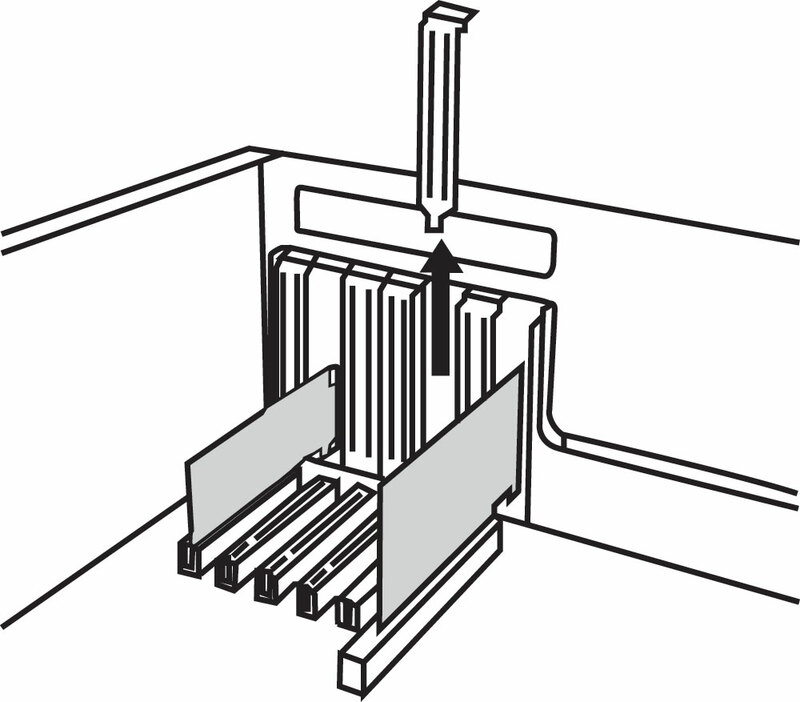 A check-up for installation between the computer case and the motherboard may prevent current flow on the computer case. If the installation is normal, then check if the power supply is defective. This improper ground may cause noise generation. For minimizing noise generation and preventing improper ground which may cause damage to parts of the computer, install an electric wire on the metal surface of the computer case, and drop the electric wire to a water pipe, gas pipe, metal desk, or bottom of the floor. The computer is strongly reco㎜ended to be connected with an extension code having ground, or to be directly connected to an outlet for proper ground. 6) Change the power supply. If your computer temporarily uses the same power supply with lighting or your computer is connected to the same power supply with the lighting due to wrong electric wiring in the building, noise may be generated by flickering of the lighting. In this case, use other power supply. For example, HIFI device employs a stable power supply using devices like a shielding transformer for preventing sound distortion and noise problems. ㆍ2 year limited warranty for free the date of your purchase is applicable. ㆍThe date of purchase is referred to the dated itemized receipt. If proof of receipt is not possible, the date of the purchase is estimated from product manufactured date. ㆍThe limited warranty is only applicable for free in case of normal usage during warranty period. Any failure or damage of the product by natural disaster (lightening, fire, flooding, etc. ), remodeling, and carelessness or mistakes of user even if during the warranty period. ㆍFor more information about product and technical support, please feel free to visit our website and go to Q&A board to be supported.